I had Symantec antivirus software (network version that I got free with Sify internet connection) running for the last six months and my system got affected more than 3 times with viruses, which are mainly from external USB drives. Before that I had AVG Free, which also failed to recognize few viruses. A month ago, I came across a report from AV-Comparatives analyzing around 16 antivirus software available in the market. It has divided the tests into 8 categories and ranked the products as Gold, Silver, and Bronze. As usual, I have gone through the report and the products to see whether they have free versions for my system. 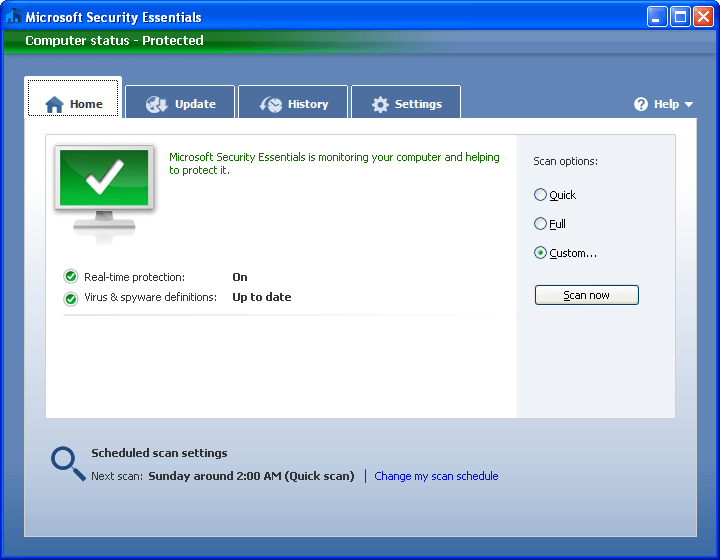 What caught my eye was free antivirus tool from Microsoft (yes it is free) called, Microsoft Security Essentials. It has secured 2 Gold ratings and one Bronze in overall 8 categories. So, I wanted to give it a try and the results were amazing! To date, my system has not been affected by any virus and has even cleaned the viruses from System Restore Folder. Detection is too fast and now, I am free of USB virus worries. â€œMicrosoft Security Essentials provides real-time protection for your home PC that guards against viruses, spyware, and other malicious software. Microsoft Security Essentials is a free download from Microsoft that is simple to install, easy to use, and always kept up to date so you can be assured your PC is protected by the latest technology. Itâ€™s easy to tell if your PC is secure â€” when youâ€™re green, youâ€™re good. Itâ€™s that simple.â€ says Microsoft on its website. Good detection of USB viruses. Able to clean the viruses that are in System Restore Folder. You need to have genuine copy of Windows. Before installing it, software verified that you are running genuine Windows OS. You cannot clean or delete the viruses until it finishes the scan. So, if power failure occurs in between, then you need to start again, which is really irritating. Sometimes it does not turn green (which tells that it is running) automatically, though it is running. We need to click it open to turn it green. Except those down sides, which I hope Microsoft will update in the future upgrades, it is the best free antivirus I have run ever. It is much better than Free AVG version. Few of my friends told me that installing it made the system slow down, though I never experienced it on Windows XP running on 512 MB RAM. Make sure that you installed the latest .Net Framework (3.5 SP1), which I think is the cause of slow down. Try it and tell me your experiences in comments section. I am in Total Agreement with you!, Microsoft Security Essentials is one Great program, and best of all it’s totally free and does a wonderful job of detecting malware. If so, why doesn’t Microsoft build in these security features with Windows OS which they sell at a high cost or offer an auto upgrade to all original Windows users? Bill Gates, why rob Peter to pay Paul? I am referring to your charities and tax payments to Govt? 1) For me, the installation of updates (not the scans, only the installation) slows down the computer seriously. And since I cannot choose which time of day the updates should be installed, it has too often decided to do that at the same time I was in a skype conversation. Most often that will cause the conversation to drop. 2) Yes, it claims to be able to clean System Restore Folder. Though I got a virus there a couple of weeks ago that MSE deleted. And deleted. And deleted. Every time I ran the scan again, the virus was back. I ended up having to remove all restore points manually. Not a big deal, sure, but I see it as quite as efficient and skilled as it wants to appear. 1. Yes, I too noted that while downloading the updates, it takes entire bandwidth making browsing difficult. I don’t see a system slowdown though. My PC is Pentium Dual Core. Go to the Settings>Scheduled Scan and uncheck the box “Check for the Latest Virus & Spyware Definitions….,” so that you can check for new definitions when you are free or going away from system for a break. 2. I too got a type of System Restore virus, which was even corrupting the files on my external USB too. Sadly, I had to reformat both my system and the external USB drive. Now, I am using Deep Freeze, an application which restores the system back to the locked stage when system is restarted. Now, my system is almost free of virus. I will be writing a review about it soon. It is not a freeware though. My problem is of course based on the old computer I have. Unfortunately your suggestion doesn’t help me, as the slowdown is associated with installation of updates, not with scans. The scans I can push away to Sunday nights (and I have done so), and if it updates an extra time then, it doesn’t matter too much to me. (I’d be asleep by then anyway). The issue is that no matter when it’s supposed to do scans, it still updates – I think – twice a day. Those updates I cannot request they be done at night or at any other convenient time – they happen whenever MS wants them to happen. There is no setting where I can choose when these updates should happen. The ironic part is that scans (to me) are less intrusive, in that the computer may work more slowly during the scan, but I can still use it. During installation: I may as well step away from the computer for 5-10 minutes until it’s finished. Well Naveen, I too like all my softwares for free. Naturally my Windows XP Professional SP2 is not Genuine. However, I find that my AVG Free 9 does the job very well and has been doing the same for years being both anti-virus and anti-spyware. I do not use the Link Scanner as the same job is done better by FF3.6 and, as a result it uses less than 50 MB of memory along with updates. The temporary update file that it creates at the time of update can be deleted through AVG or better still by running CC Cleaner. One needs also to install an anti-malware and I use the free version of Malwarebytes’ and run it on a weekly basis. Microsoft Security Essentials was able to catch the virus, which AVG failed. I have tried Avast too, but was not happy with that.